The 1st Congress of the Society for Urban Ecology took place in Berlin, Germany, from 25th-28th July 2013. Urban ecology researchers and students from all five continents came together to share their research and ideas through presentations, symposia and valuable discussions. It was evident from the academic and professional breadth of delegates and the topics discussed that urban ecology has a vital role to play in meeting the sustainability challenges of the future. 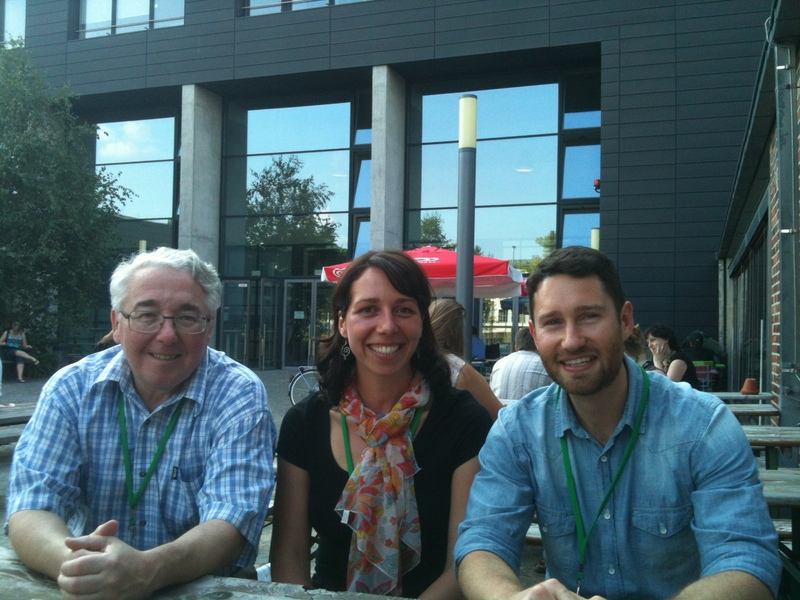 Chris Ives met up in Berlin with Mark McDonnell, the Director of the Australian Research Centre for Urban Ecology (ARCUE) and Tanja Straka, PhD student at ARCUE, to attend this conference. In the symposium on urban biodiversity, management and governance, Chris, gave a presentation entitled ‘Bio-amenity: The convergence of biodiversity conservation and amenity provision in urban landscapes’. He outlined that the traditional focus of city planners on the provision of amenity oftentimes conflicts with the more recent goal of conserving biodiversity. The central message of the presentation was that overlaps between amenity and biodiversity need to be identified and promoted in the cities of the future. Tanja Straka spoke in the Symposium of Young Researchers about her social research on attitudes towards urban wetlands and the evidence of biased processing of ecological information. Her presentation entitled ‘Urban Wetlands for Wildlife and People’ was awarded the Best Oral Presentation Award. Renowned urban ecologists gave keynote lectures which provided inspiration to the audience on the past and future of urban ecology. Prof. Ingo Kowarik (pictured to the left, with Mark McDonnell), from the Technische Universität Berlin, Germany, started the Congress with an overview of the early days of urban ecology in Berlin until today and reminded the delegates of the importance of rigorous science and experimental methods in answering important questions on urban ecology. Prof. Karen Seto, from Yale University, USA, followed on the second day and encouraged the audience to think about new paradigms and the necessity to transfer knowledge to planners. Prof. Wei-Ning Xiang, from the East China Normal University, Shanghai, China (and co-editor of Landscape and Urban Planning) motivated the listeners to develop ‘ecological wisdom’ by turning towards historical examples for inspiration on how to work with nature to find solutions to tomorrow’s problems – such as of that of Li Bing (3rd century BC governor in China, creator of a major irrigation system that prevented devastating floods but allowed continued flow of water and fish, an ecological engineering feat and still in use today) and the landscape architect Prof. Ian McHarg (renowned early contributor to the field of ecological planning and to the early development of what was to become Geographical Information Systems, GIS). Prof. Xiang argued that bringing together the creativity of as yet validated ideas and principles, whether from the East or West, from ancient times or contemporary, is beneficial to inform the research and practice of urban sustainability planning. In his summary of the conference proceedings, Dr. Steward T.A. Pickett from the Cary Institute of Ecosystem Studies, New York, USA and Director of the Baltimore Ecosystem Study encouraged urban ecologists to be mindful of how individual research projects might fit within broader theoretical frameworks. Dr Pickett proposed a new ‘continuum of urbanity’ theory, which is grounded in four essential components of human-ecological systems: livelihood, lifestyle, linkages, and the role of place. This framework provides a useful and realistic context for urban ecological research in the future. All in all, it was an encouraging Congress which showed that although there are still many unanswered questions in the research field of urban ecology, many distinguished researchers and enthusiastic young researchers worldwide are taking up the challenge to address both basic and applied questions about the structure and function of urban ecosystems. It was evident that the discipline of urban ecology is broad and heterogeneous and requires interdisciplinary studies. The mixture of social and biophysical research, along with more applied aspects such as policy analysis and practical know-how, makes it a unique and exciting field of study. However, in this context, we were struck by the pressing need to ground this work in strong theory and to conduct high-quality science. This approach is necessary to ensure that urban ecology has the strength and depth of understanding to address some of the most pressing challenges facing the planet in the coming decades. This entry was posted in News on October 1, 2013 by Chris Ives. Elsevier has bought Mendeley! Just when Menedely had ironed out most bugs and was getting really useful. This is possibly sad news. See their blog entry here and the public reaction in the comments! I’m going to be investigating moving to Zotero as my main reference manager. It’s open source and unlikely to ever be purchased by a large multi-national. I’ve also heard good things about it. This entry was posted in News and tagged open science, reference manager on July 18, 2013 by ascelin.